Allow us to take you on a tour from Africa to Trinidad & Tobago and back to Africa, by welcoming you to the Steel Drums Dance Company. When Africans were forcefully enslaved and taken to Trinidad and Tobago to work on sugar plantations, they weren't allowed to take their drums with them. This presented a problem because to Africans, music and drumming was, and still is a huge part of our culture. As a result, other objects became used as percussion instruments and the first widely available resource were biscuit tins. 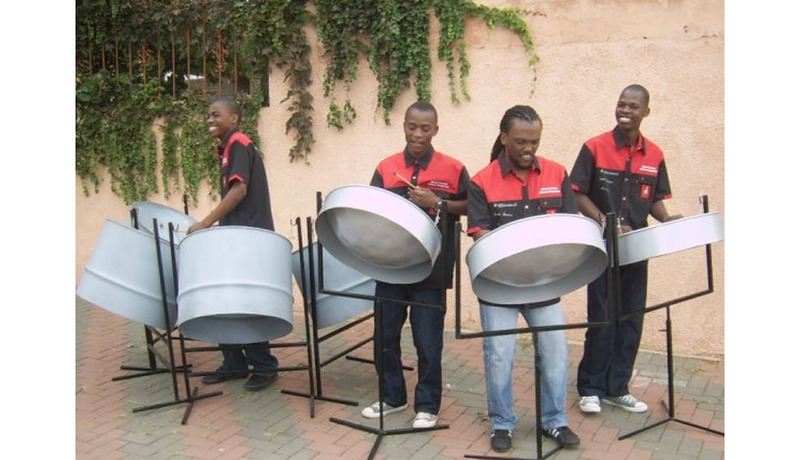 Steel pan, also known as steel drum is a pitched percussion musical instrument originating in Trinidad and Tobago. In fact, drum refers to the 50 litre oil drum containers from which the pans are made. The steel drum is correctly called a steel pan. The steelpan may have first come from Trinidad but its true roots lie in Africa, since it was created to replace traditional African drums like the Jembe. One regular day in the 1940's a man was playing in a percussion street band. His instrument was a large tin and a stick with which he beat a low bass rhythm. As he played, he beat the level bottom of the tin in and stretched the metal thinner and tighter. He soon lost his bass note and found himself playing way too high pitched a note. This was not what he wanted and he bashed the bottom back out with a rock. He was very surprised to find that there were now three different notes that he could play on one surface. His idea became very popular and as interest grew the people moved onto using oil drums instead of tins. Thanks to this, we now have instruments made out of oil drums that have the full range and versatility of a concert band. Through our accrued extensive musical experiences, we decided to experiment with the Caribbean instruments, the steel drums, and we played hits from some of Africa's musical legends. The Steel Drums Dance Company has brought the pan back to Africa, playing African tunes mixed with Caribbean sounds.